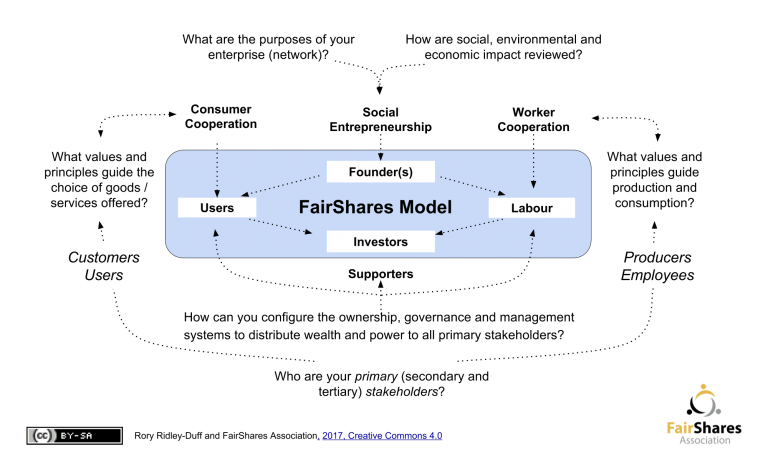 The FairShares Model enables you to (re)design companies, cooperatives, associations and partnerships to fully recognise and reward enterprise founders, workforce members and users/customer who invest natural, human, social, intellectual, manufactured and financial capital. We recognise that wealth is generated by stewarding nature to enhance human skills and capabilities, building relationships between people, enabling them to generate and share ideas that stimulate goods to meet human, societal and environmental needs. By recognising and rewarding these six capitals, a more ethically grounded concept of wealth guides our human endeavours to create, distribute and reinvest forms of capital to meet a wide variety of needs. seven ICT support platforms (05). They were initiated through a research programme on democratising charities, co-operatives and social enterprises involving academics at Sheffield Hallam University and Manchester Metropolitan University in the UK, and developed as part of an EU Erasmus+ project to create FairShares Labs. 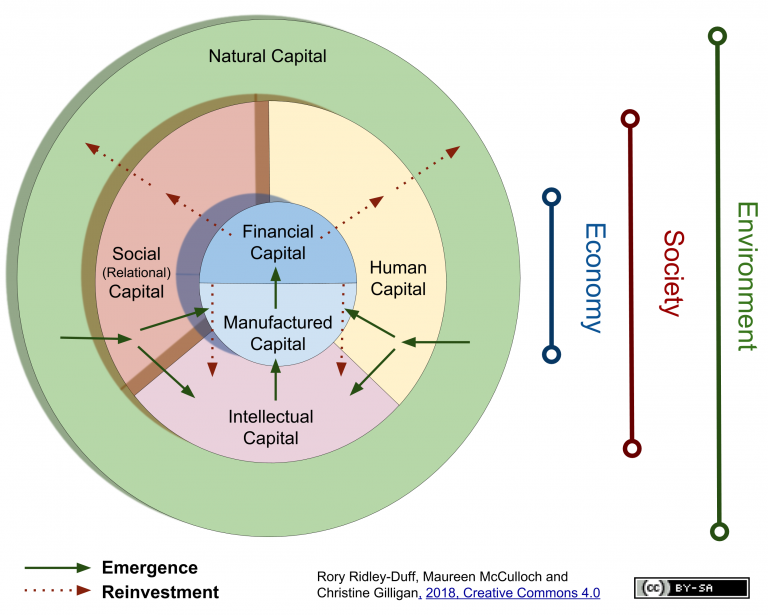 The model promotes cooperative social entrepreneurship that recognises and enfranchises the providers of different types of capital contribution. Memberships (and shares in companies and cooperatives) can be offered to investors of every type of capital by redesigning companies, cooperatives, associations and partnership to fully recognise and reward enterprise founders, workforce members, users/customers and the creators/providers of financial capital. First, we devised a set of values and principles based on a definition of social enterprise created in January 2012 by Social Enterprise International Ltd. We link these values and principles to key questions for enterprise incubation and development. Second, we identify who is best able to answer each question to develop a design philosophy and governance model. 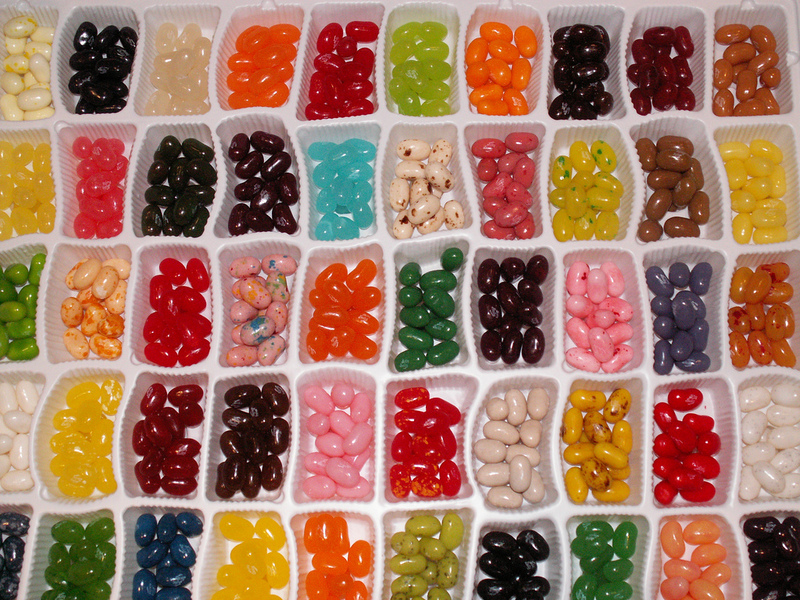 Social auditing and diagnostic tools can help develop the architecture for ongoing development of ownership, governance and management systems. Lastly, to encourage the social systems to endure, we apply the design principles to model constitutions for companies, co-operatives, associations and partnerships. 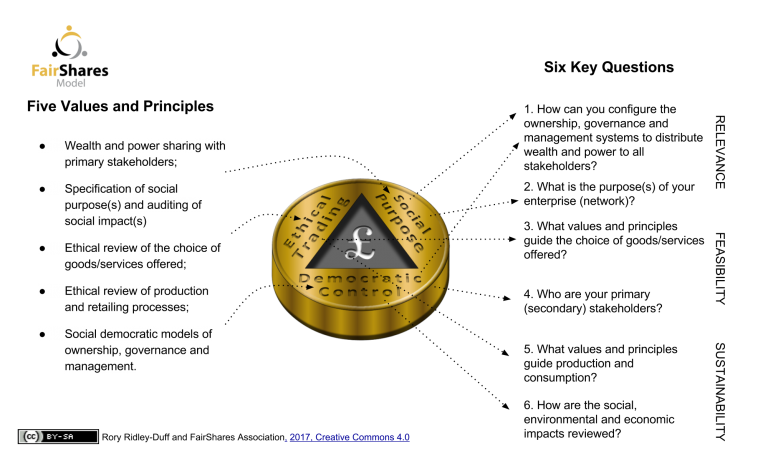 The model constitutions provide a kind of social DNA for the replication of the five principles by implementing them through new approaches to ownership, governance and management. We believe these systems will make it easier to achieve UN 2030 sustainable development goals. 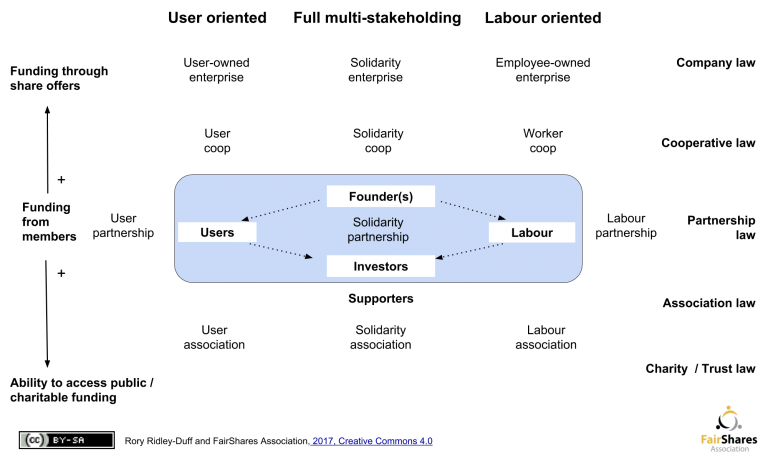 From 2019, you will be able to obtain support for developing your FairShares ideas by joining a local or virtual FairShares Lab. 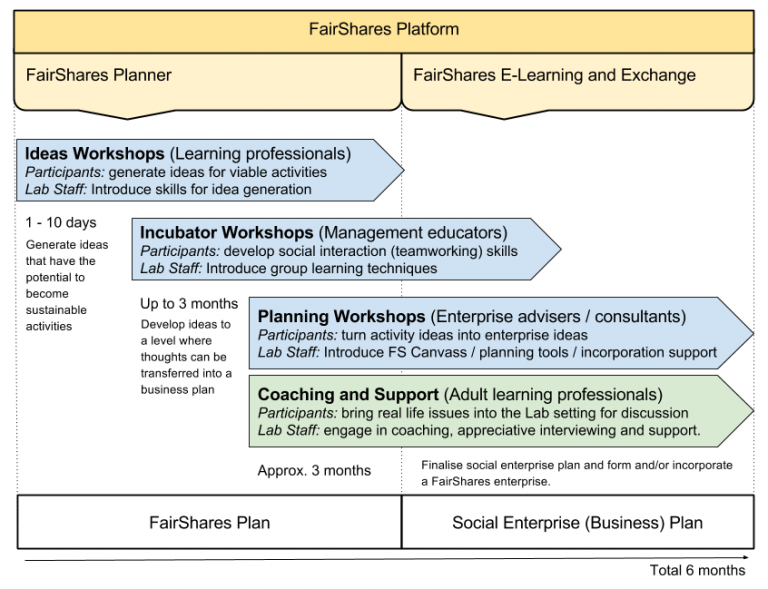 Each lab will provide workshops and support tools to help you consider the questions in a FairShares Canvass. Through workshops, learning processes and with coaching and support, you will be able to design your multi-stakeholder co-operative enterprise by answering the questions in your FairShares Canvass.